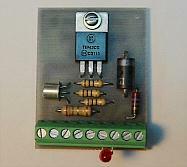 Building Transistor Ignition Modules - You can build them yourself from kits for peanuts! The TIM-6 module will deliver one spark to the spark plug each time the magnet passes the Hall sensor. This module can deliver dozens of sparks to the spark plug each time the magnet passes the Hall sensor.